Within the next decade the amount of aviation passengers could double. It has been widely admitted that today’s airports cannot cope with demand. Future expansion will create additional terminals causing bigger distances to travel, more congestion, pollution and increasingly slower handling times. Larger parts of the operating costs of the entire air transport system revolve around the aircraft. Therefore, the tendency has been to stimulate technology breakthroughs in aircraft design to reduce overall costs. 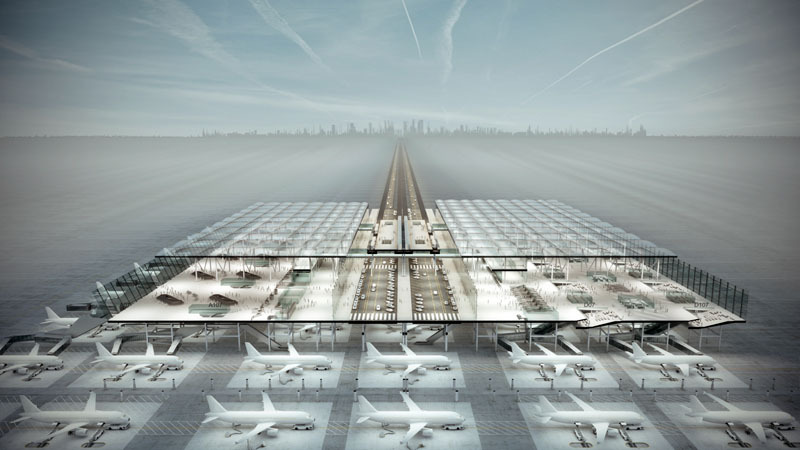 With this perspective, airports have responded to the airplanes as the primary solution rather than focusing on new typologies / rethinking the notion of the airport itself. 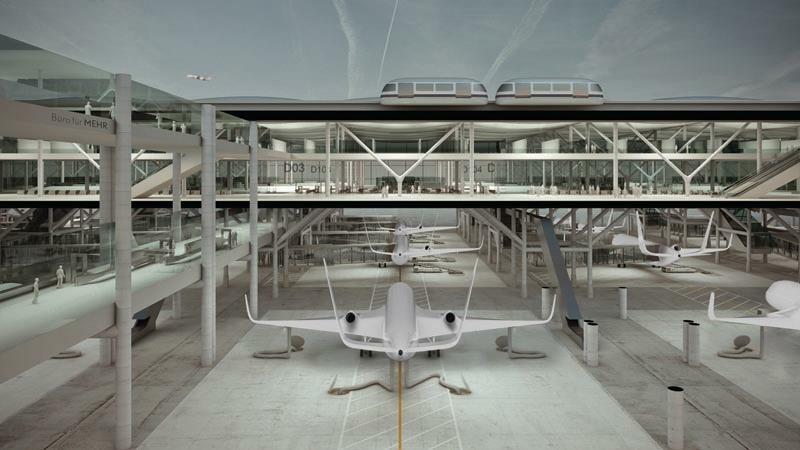 As a result, contemporary airport layouts are determined by vast parking spaces, where aircraft are laid out endlessly side by side. 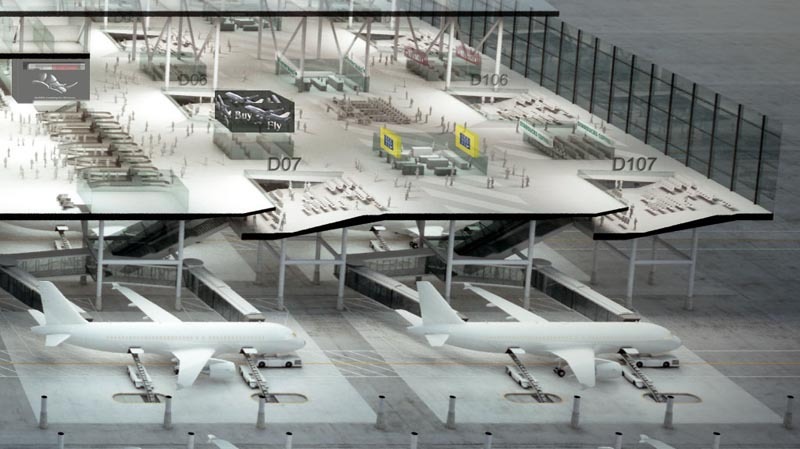 Optimizing terminal buildings through densification requires a new concept. A drastic reduction in the size of airports would not only simplify ground handlings, but would also significantly reduce its environmental impact. DRIVE THROUGH AIRPORT reduces the required space for a terminal building by two-thirds, making the airport experience for both passengers and crews more user-friendly. It reduces the ecological footprint, while making space for additional airport related estates. DRIVE THROUGH AIRPORT sends all arriving aircraft through a path, separating the main handling phases into three stations: Arrival, Servicing, and Departure. Each station manages only one activity instead of being blocked for all three. The amount of necessary gates can be reduced by two-thirds! DRIVE THROUGH AIRPORT covers the processing aircraft by an elevated terminal. While the airplanes are moving through their dedicated stations, passenger processing takes place on a level directly above. Traffic to and from the airport is situated above the servicing stations dividing the terminal into two buildings: Departure Mall above the departure gates, and Luggage Claim Hall above the arriving gates. For transfer passengers and crew there is an underpass connection. DRIVE THROUGH AIRPORT reduces transfer time for passengers , ultimately minimizing the number of passengers missing flights, saving resources and crucial costs for airlines. DRIVE THROUGH AIRPORT enables airport operators to increase their commercial revenue. Departure takes place directly in the mall. Contrary to current terminals (e.g. Schiphol), where passengers are required to leave the mall area, in order to walk to their distant boarding gates- and wait there for boarding.